It’s time for a contest! My email newsletter is one year old, and to celebrate we’re going to try to reward old subscribers and new ones alike. In case you’re not familiar with it, my newsletter is free and goes by email twice a week to subscribers. It offers a link to my latest column, some behind-the-scenes commentary, suggestions for books, and links to articles I admire. I’m going to offer signed copies of my books to eight newsletter subscribers picked at random (eight is a lucky Chinese number, and I started my foreign correspondent career in Asia). In addition, we’ll pick one subscriber for a tour of The Times and lunch with me — or, if the winner is in, say, Madagascar, then a phone conversation with me. Or if you want something else, like me leaving your voicemail recording, that can be arranged. In addition, I’m hoping to get more students to subscribe. So if every student in a classroom (university, high school, middle school or elementary school) subscribes to the newsletter, then tweet my assistant, Liriel Higa, at @idiplomacy. I’ll randomly skype one such class to answer questions, or if you’re in the New York area, I’ll invite you all to The Times. This is, of course, a blatant marketing effort to draw more people to my newsletter. I’m always struck by how many people look for my columns but are unaware that the newsletter is the best way to get them — and is free. So consider signing up (or take my approach and sign up your kids!). And stay tuned for the winners. As always, I welcome your thoughts on how to make the newsletter better. It’s an experiment, one that the rest of The Times is following as well. I’m always a bit uncertain how long to make the newsletter, what kind of items to include and so on. So for those of you who have already subscribed, your suggestions are most welcome — and help spread the word to those who aren’t subscribed yet and tell them to sign up. 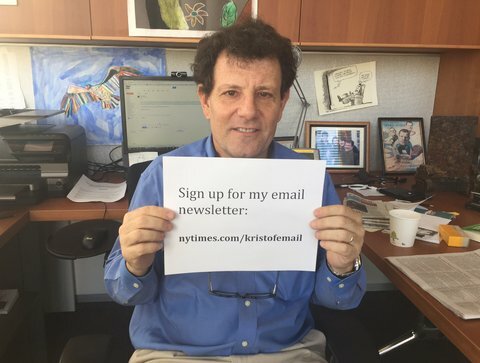 This entry was posted in Uncategorized and tagged #GMABlog, #Journalism, #Newsletter, #NewYorkTimes, #NicholasKristof, GMA, Media by BlogGMA. Bookmark the permalink.